Medical ID Bracelet for single Medical Condition. 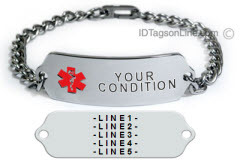 Medical ID Bracelet for single Medical Condition. Copy & paste Condition from Table below or type it directly. If you have a single medical condition, this style of Medical Id Bracelet is an option to consider. We will engrave your condition on the front, just right of the medical emblem in clear visible way to draw attention when needed. To make it easier you can copy and paste your condition from the table into appropriate field below. If you do not see your condition in the table, please, take a moment and send us an e-mail. We will add it to the table. On the back you have 5 lines, 20 characters in each line for your personal information. Medical ID Bracelet, IDB55 (size 1-3/4" x 1/2"), is made from .062" thick premium Stainless Steel, and is hand polished to the mirror finish. It is guaranteed to be rust free for the life. Colored enamel medical Id logo is located on the left hand side of the plate. We have Red, Blue, Pink and Clear colors. The bracelet tag is slightly curved for wrist wear. Please copy and paste your Medical Condition to the field above, or simply type it.